The Templar Knight Steel Shield by Marto, of Toledo Spain, is an ornamental triangular shield, known as a kite shield, made from steel and embellished with gold. Pointed at the upper part, this shield possesses a natural metallic finish that does not diminish its beauty. Instead, it merely makes the shield appear both functional and beautiful. At the shields center are the symbols of the Knights Templar. 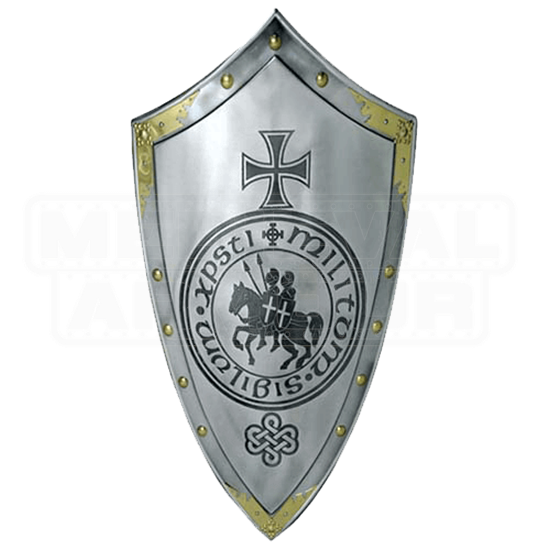 A Templar cross is set above the seal of the Templars, which depicts two knights riding a single horse (which symbolizes both the dual nature of the order, as well as the orders originally poor status), as well as the phrase Sigillum Militum Xpisti (which means Seal of the Militant Order of Christ). The shields edges are embellished with gold rivets, while the edges are decorated with brief touches of gold-plated metal sheets. 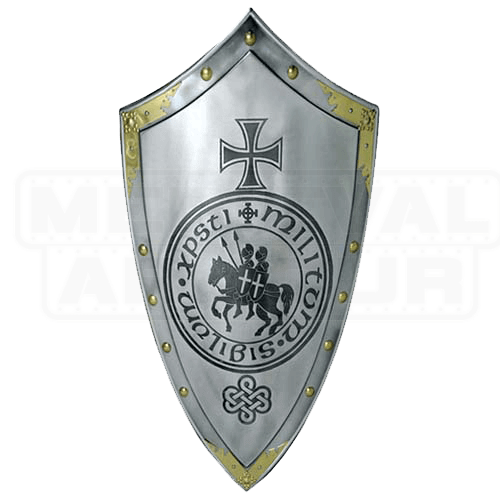 A shield fit for a hero, the Templar Knight Steel Shield, by Marto, is a one-of-a-kind piece that is as eye-catching as it is appealing.